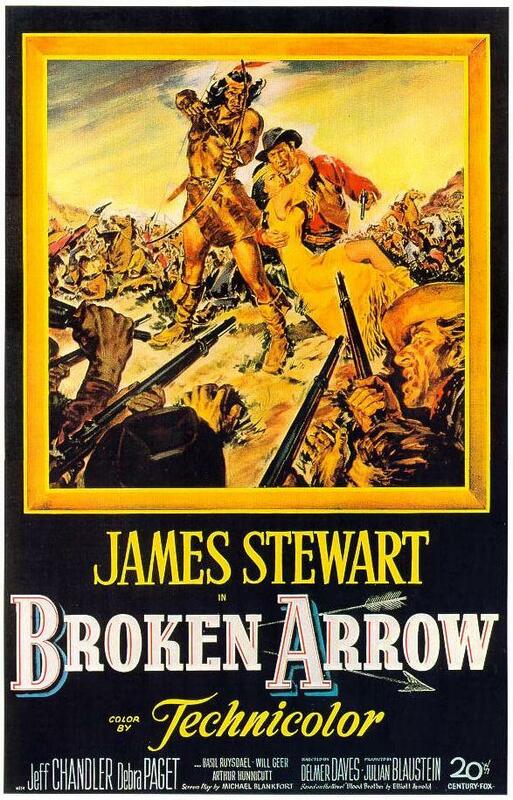 In 1870, former Union soldier and scout Tom Jeffords (James Stewart) is a prospector in Arizona Territory, where Cochise’s Apaches have been at war with the Americans for ten years. Jeffords gives a wounded Apache boy medical attention, and is spared by Geronimo when he attacks another band of prospectors. In Tucson, Jeffords is asked to scout for Col. Bernall against the Apaches and declines, tired of war and fighting. He makes a bet that he can get five mail riders through Apache Territory and spends a month learning Apache language and culture. He is supported by his friend Milt Duffield (Arthur Hunnicutt), who manages the mail and offers to be the first rider. Not even Tom Jeffords (James Stewart) is safe in Apache Country. 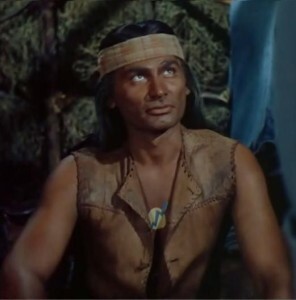 Jeffords makes a trip to Cochise’s stronghold to ask for the chief (Jeff Chandler, in one of his signature roles) to let the mail riders through, promising that they will carry no military information. After getting to know Jeffords, he accedes to the request. Meanwhile, Jeffords meets Apache maiden Sonseeahray (Debra Paget, everybody’s favorite 1950s Indian maiden). One-armed Gen. Oliver O. Howard (Basil Ruysdael) comes west and joins Col. Bernall on a raid into Apache territory. Bernall rushes into an Apache ambush and his column is all but wiped out by Cochise’s forces. Jeff Chandler as the wise and powerful Cochise. Back in Tucson, Jeffords gets into fights with Indian haters, particularly with Ben Slade (Will Geer), whose ranch was burned by Apaches with his wife still in the ranch house. As Jeffords is about to be lynched, he is rescued by Gen. Howard. Although Jeffords is suspicious at first, Howard explains that, motivated by his Biblical beliefs, he wants to make peace with the Apaches, and he wants Jeffords to set up a meeting with Cochise. Jeffords goes to Cochise, who calls in other Apache leaders for the conference with Howard. Meanwhile, Jeffords marries Sonseeahray. The Apache leaders vote for a provisional peace with a three-month trial period and Cochise symbolically breaks an arrow, but Geronimo (an uncredited Jay Silverheels) leads a dissenting Apache faction that will continue to raid. 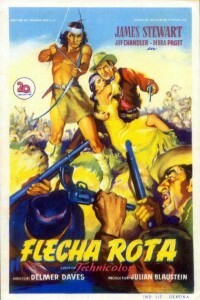 During the trial period, Geronimo attacks a stage, but Jeffords leads Cochise’s men in a rescue. Ben Slade’s son leads Jeffords and Cochise into a trap to kill him; Jeffords is wounded and Sonseeahray is killed, as are Slade and his son. Cochise remains committed to the peace, and it endures—for now. 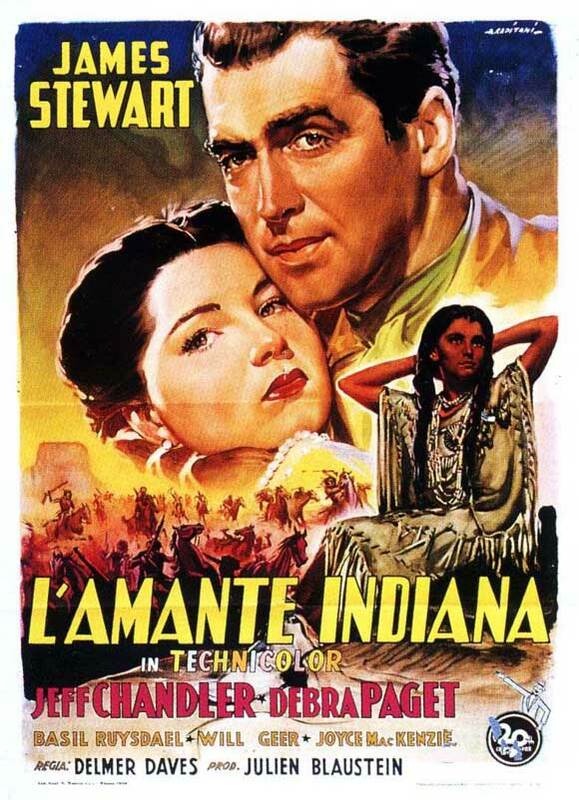 Jeffords (Stewart) and the young Apache maiden (Debra Paget). The film was a breakthrough in its time because it depicted Indians in a sympathetic light. Director Delmer Daves had a background as an anthropology student, and some scenes of Apache ceremonies and beliefs have an interesting anthropological bent. 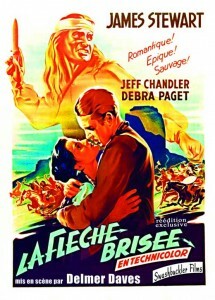 In the 65 years since its release, however, it has sometimes been criticized because some of the Indian roles, including Cochise and Sonseeahray, are played by white actors. Jeff Chandler as Cochise is the ultimate noble savage, depicted as a far-sighted civil leader and a great military mind. He received an Oscar nomination for the Best Supporting Actor for his work here. Daves went on to create several more excellent westerns during the 1950s. This film was the forerunner of such Indian-sympathetic films as A Man Called Horse (1970), Little Big Man (1970) and Dances With Wolves (1990). It’s not perfect; it can seem a little stiff and politically correct for modern times, but it still makes good watching. And mostly it’s historically accurate, as it claims in the opening narration, describing a peace reached in 1872. That peace lasted only until 1875, when the Apaches were forced onto a reservation. Cochise died in 1874, still friends with Jeffords. The Apache wedding words pronounced over Sonseeahray and Jeffords, often used since in many weddings of whites, are not authentic in the sense that they are not part of a traditional Apache ceremony. They were written for this film. 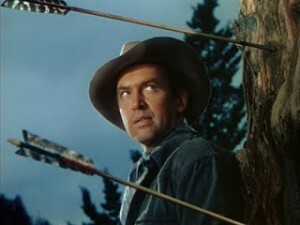 The movie was shot in 1949 but released in 1950, after Stewart’s first western with Anthony Mann, Winchester ’73. Both were very successful. 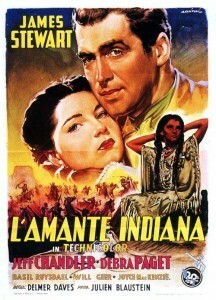 Stewart at 41 is 26 years older than Debra Paget, who was 15 when filming began. Based on Elliott Arnold’s novel Blood Brother, Albert Maltz wrote the screenplay but was blacklisted as one of the Hollywood 10, and the screenwriting credit is given to Michael Blankfort as a front for Maltz. Music is by Hugo Friedhofer. Shot in Technicolor (but not widescreen) in Sedona, Arizona. 93 minutes. The movie’s world premiere was held in the Nusho Theater in Broken Arrow, Oklahoma. 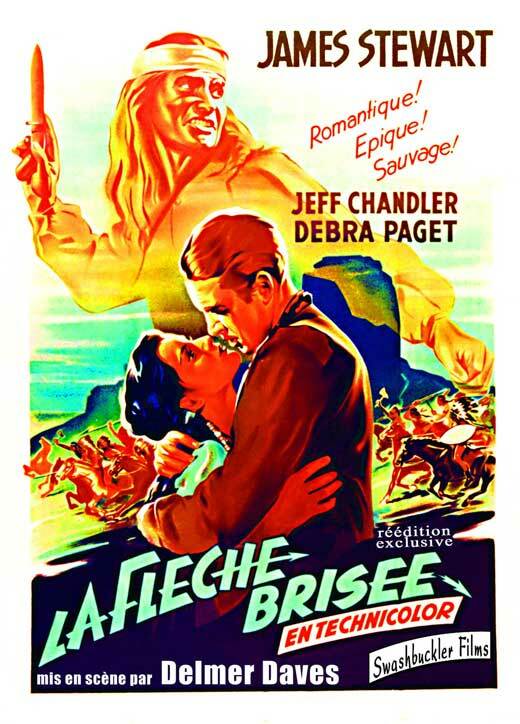 Jeff Chandler and Jay Silverheels would reprise their roles as Cochise and Geronimo in The Battle of Apache Pass (1952), a sort of prequel to this film. Another western classic depicting Cochise as a gifted military leader is John Ford’s Fort Apache (1948). This entry was posted in Westerns Worth Watching and tagged Delmer Daves, James Stewart, Jeff Chandler, Native Americans (Indians) on July 18, 2014 by Nicholas Chennault.